Together we can continue the marathon. Nipsey didn't just rap about it, he backed it up with action, his words say it best "I'm going to always stand on what I do". In his 2018 Breakfast Club interview, he put us on game about the steps that he was taking to invest in the community and what he would like to see the Black community do more of. He wanted "access" because "we are underrepresented in technology". He wanted us to be "aggressive" when actively taking steps to reinvest in our community. A standout moment in that interview began was when he "said that we should want access, we should want to be included not only should nobody let us, it shouldn't be affirmative action, we should be educating ourselves and being aggressive". He had a strong command of the entrepreneurialism and how when executed properly, could uplift, mobilize and rebuild the community. One of his many actions to stand on what he does was to partner with David Gross, a private-equity and real-estate investor who had the "idea for an inner-city co-working space" as stated by Forbes on the creation of the coworking space Vector90, with the purpose of being a "cultural and intellectual hub for entrepreneurs and creatives, and will heighten the economic and social fabric of the neighborhoods we enter"
On the evening of April 2, 2019, I had the privilege of experiencing the impact that his life had on the lives of many. Donovan Bridgeforth, Founder and CEO of The BLK App, and co-contributor Brandon Banks, CEO of Dallas.Live hosted a pop-up tribute event at Paul Quinn College, an HBCU in Dallas Texas. 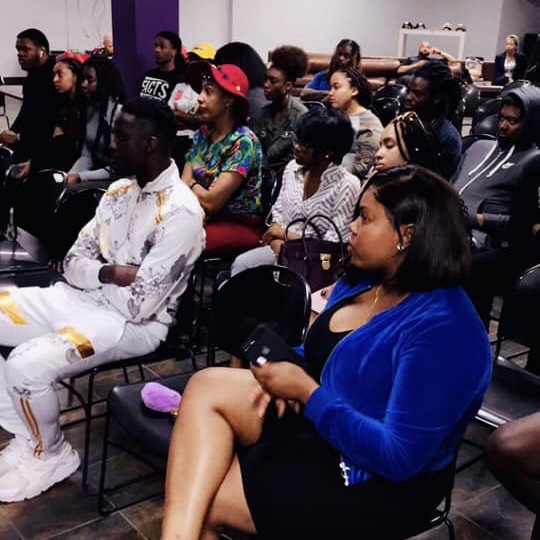 Their vision was to create a safe place where anyone impacted by Nipsey Hussle’s life and legacy could come process, share their feelings about what he meant to them, and plan next steps for community organizing all while listening to his music catalog. The audience engagement was palpable, one of the very special moments of the #ContinuingTheMarathon Pop Event, was the panel discussion, moderated by SGA President Evelyna Rosario who played a key role in bringing the event to campus. Evelyna facilitated the discussion with local entrepreneurs about the importance of investing in our Black community by creating entrepreneurial opportunities and supporting both Black-owned business and Black financial institutions, essential components for closing the racial wealth gap. During the panel, Donovan shared with the full room that he wanted to do this "...so that people don’t feel such a big loss because we have people in our city of Dallas, Texas that we can lean on like we did Nipsey” for direction on how to activate and empower our community. Towards the end of the event, audience members that ranged from college students to community organizers to aspiring and seasoned entrepreneurs stood up to share how they will ensure that his legacy will live on through their commitment to investing in their communities. One young man said that one of his goals was to start his own bank because he is tired of going to banks where he doesn’t know where his money is going and supporting systems that “don’t give a d*mn about us”. That’s a strong and valid statement from a passionate future leader. When you feel that big banks have monopolized and pulled out of your community, leaving a banking desert in their wake aren’t doing business in a way that empowers the lives of your community, you can feel disenfranchised. That feeling becomes exacerbated when you learn that Black-owned financial institutions are decreasing in number. As of the 2018 third quarter FDIC MDI Data report, there are a little more than 20 Black-owned banks remaining. This is significant when you learn that “In 2007, prior to the recession, there were 41 banks with majority African-American ownership.” a fact pointed out by Jeanne Lee. Not every bank has a big online social media presence, which is why it is necessary that we know who they are so that they can be supported. Here is a list of the remaining Black-owned financial institutions. Banking Black hits differently when you know that your support of these institutions and the movement can potentially keep more from closing. I am thankful to know that there is a young community that wants to build themselves up, who want to focus on entrepreneurship, who want to buy back the block. The law of conservation of energy states that energy can neither be created nor destroyed - only converted from one form of energy to another, so the energy that Nipsey put into building our community will live on. To have lived a life and left a legacy that has empowered young people to become entrepreneurs and intentionally invest in their communities is a legacy that we can all aspire to. If you believed in Nipsey Hussle’s dream of rebuilding the community, don’t forget to bank Black! Job well done Ermias Asghedom; may you rest in peace.